Introduction: Reactive oxygen species modulator-1 (Romo1) is a protein that modulates levels of reactive oxygen species (ROS) and has been reported to affect cancer cell invasion and proliferation via persistent inflammation. Several studies have demonstrated the clinical application of Romo1 as a prognostic marker in non-small cell lung cancer (NSCLC); however, there have been no studies investigating the mechanism by which Romo1 adversely affects the prognosis of these patients. 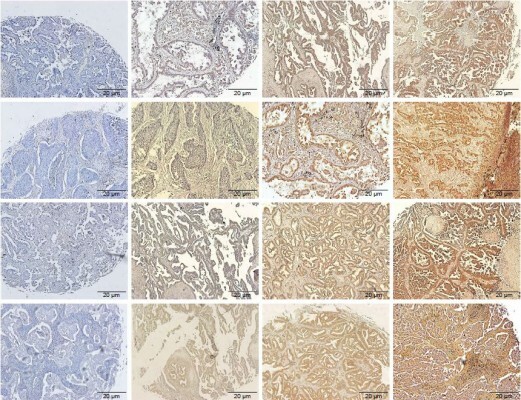 Methods: We examined Romo1, ROS, and vascular endothelial growth factor (VEGF) in tumor tissues immunohistochemically. We conducted survival analyses of patients who had curative resection (n=30) in accordance with clinical parameters including levels of Romo1 expression. Results: Romo1 levels were associated with serologic inflammatory markers and high lymphatic metastatic tendencies. Significantly longer disease-free survival (68.7 vs 24.2 months, P=0.031) and overall survival (92.7 vs 51.6 months) were observed in the group with low Romo1 compared with high Romo1. Survival outcomes were also significantly associated with serologic inflammatory markers. Spearman’s correlation analyses demonstrated significant positive correlations of Romo1 expression with VEGF-C (P=0.008, R=0.478) and ROS (P=0.016, R=0.436) in tumor samples. Conclusion: The current study demonstrates that Romo1 induces lymphatic metastasis of NSCLC by modulating persistent inflammation and oxidative stress (ROS)/VEGF signaling. Lymphatic metastasis associated with elevated Romo1 was shown to be a key reason for unfavorable survival rates.